Over the last few months my laptop has been slowly but surely dying! As such, blogging has become harder and more time consuming and often I’ve turned on my computer to write a post but given up due to how long it’s taking to do everything. So last week, I reformatted my laptop. It took several attempts as Windows 10 simply refused to let me restart, giving me an error every time I tried, so in the end I went old school and did it via bios and a disk. Unfortunately this has meant reverting to Windows 7 as that’s what my laptop originally came with but I have to admit that its much faster and my laptop doesn’t seem to be overheating and switching itself off now either. Anyway, this evening I have spent my time re-installing everything back onto the laptop, like Microsoft Office, Paint Shop Pro etc. as well as importing my bookmarks, sorting out all my saved files into a neat place and really just making my laptop feel useable again. I definitely hope this means I will be back to blogging more often as I have movie updates about “Sing” and “The Lego Batman Movie” to make, as well as what we did for Valentine’s Day as a family AND some chocolate recipes that Lily and I will be working on tomorrow. So really I just wanted to add a quick update to apologise for the silence here on my blog and to assure you that it was just temporary and I hope to be back more often now! So I was going to do my November monthly round up but the truth is I don’t really remember much of it as it went past in a blur! I genuinely don’t remember the last time I felt like I had some spare time to sit down and just blog about life and how things were going. Anyway, today I do and so here I am to give you a little update! November was hectic and the look on Tink’s face (see mug) was pretty much my face for the whole month (and still now really). Since September and October were crazy busy with Halloween, I didn’t start my Christmas Market prep till November and this proved to be pretty stressful. That said, I managed okay and Christmas Market has now been and gone and I can breath a sigh of relief. Orders and CG are still busy but somehow by comparison, life feels quite calm right now. Aside from the above mentioned preparation, not a whole lot happened in November but there are a couple of things worth noting. First and foremost, things started to get a little Christmasy! We attended Gainsborough’s Christmas Light Switch on, got Christmas coffee from both Starbucks and Costa, plus I had a little Christmas Lush (I hope to have more!). Second, we were lucky enough to see two fantastic movies this month – one being Fantastic Beasts and Where to Find them, the other being Moana. Both were really amazing in completely different ways but it really was great to have another Harry Potter movie to look forward to and of course a dose of Disney (especially one I hadn’t known much about and was surprised by how much I enjoyed it). Other than that, there hasn’t been a whole lot of new going on. We did all have a family get together on November 20th as that would have been my mum and dad’s 40th Wedding Anniversary, had he still been around, so that was nice but a little sad too. As I mentioned, life has been pretty hectic but it finally seems to be settling down now. The girls have a fair bit going on at school so I’m coming and going a lot right now but hopefully I will be finding time to blog again now, in between making orders, opening advent calendars and picking the girls up from school discos. This month has Megan’s birthday and Christmas in it, so I’m definitely hoping to make the most of December. As you’ll have seen, I haven’t been posting as much recently as I did before I went on holiday to Florida. At first it was tiredness and a need to get the holiday clothes washed, the house straight and life back to normal etc. Then it was procrastination of all the things I wanted to post about to do with the holiday. Finally life got busy again, then it got tiring and then it all just piled up! This week has been bank holiday weekend, half term and tomorrow it will be my birthday. I’ve mostly been concentrating on spending time with my kids as it’s nice to have some time together. However I’ve made some decisions, because I know it’s been holding me back with my blogging. While I fully intended to do a post about each Disney World Park and Universal Orlando, I just can’t find the motivation to do so. As so I’m writing off my holiday as thoroughly enjoyable but I don’t want to ruin it by dragging out long posts that just feel like hassle. So if you want to read about my Florida trip, read Monday Round-ups week 14, 15 and 16. We had a fantastic time and maybe some time in the future I’ll write up some sort of tips post but for now I’m done with Florida. I have a few posts however that I do still want to catch up on – one is Nutella Cheesecake, another is MCM Comic Con this last weekend and undoubtedly I’d like to post about any birthday celebrations I get up to over the next few days. Otherwise I’m starting fresh next week, onwards and upwards, hopefully more motivated. I’m now working (volunteer) in school and getting some office experience, so my free time isn’t as free as it was. However I’m really hoping to get back to my sewing machine too and run up a few more creations. I’d like to open a store and maybe sell a few of them but that’s a work in progress right now so we’ll see how that goes on. I’d also like to write murder mysteries but there doesn’t seem to be spare minutes for that. Finally I’m really wanting to get my house sorted over the next few months. Today I laid lino in the front doorway, with the help of the girls. This is a small job but one that has needed doing for a long time now. I’m going to make a list of everything that needs doing, from big jobs to small and get cracking with it. Every day there becomes more and more reasons to move and less and less reasons to stay. If I get time, I’ll post about my birthday stuff on Saturday, then 52 Project on Sunday and my Monday Round-up again on Monday. After that I’ll start a fresh and renewed hopefully, bringing posts because I want to, not because I feel I have to! Hope you’re all having a great week. Please check in again soon. Picking up where I left off after Week 14’s round up, Monday (6th) was another day in Magic Kingdom. It started early with breakfast at Cinderella’s Castle (Cinderella’s Royal Table) which included an initial meet and greet with Cinderella herself and then also meets with Snow White, Aurora, Jasmine and Ariel while we were eating our breakfast. Amy and Olivia were there too, though we were booked separately, but this was the first time we’d seen them as they’d only arrived in Florida the day before. We spent majority of the day in Magic Kingdom, meeting Winnie the Pooh and Tigger, riding the Barnstormer, Peter Pan’s Flight and Haunted Mansion. However after lunch we headed back to the villa and had a relaxing afternoon, a little nap and then heading back to Magic Kingdom to see Celebrate the Magic, Wishes and then the Electric Parade. On the Tuesday we headed back to Universal Studios and Islands of Adventure. We’d had our “Harry Potter” day there and so this day was to do all the other stuff. We originally met up with Amy and stayed with her for a while in Hogsmeade, largely so she could get the use of her dining plan (we went to The Three Broomsticks). After we went our separate ways though, the four of us decided there wasn’t much we wanted to do in Islands of Adventure and instead caught the Hogwarts Express again, back to Universal Studios. There we went on Twister, Shrek 4D, E.T. Adventure, Terminator 2 3D and finally Minion Mayhem. We also had photos taken with Minions and Gru. It was fairly late by the time we left and the four of us grabbed McDonalds and Taco Bell on the way home. Wednesday we were having a day away from the parks and we instead went to Kennedy Space Center. While it wasn’t really high up on anyone’s list, it was something we felt we should do when we had the opportunity. It was actually incredibly enjoyable and we all enjoyed our day – especially as it was much slower paced than other days. We enjoyed a coach tour as well as several museums/foot tours. The shuttle launch simulator was by far the best part of the day however and after a great day we all went back to the villa for dinner. Thursday was an early morning again as we had breakfast at The Grand Floridian – 1900 Park Fare. This was another character breakfast and we saw Winnie the Pooh and Tigger again, along with Alice in Wonderland, the Mad Hatter and Mary Poppins. The breakfast was buffet style and it was really nice. After breakfast we headed to Magic Kingdom, this time we rode The Seven Dwarves Mine Train and The Voyage of the Little Mermaid, went on Enchanted Tales with Belle and met Cinderella and Rapunzel in Fairytale Hall. We also had a drink in Gaston’s Tavern and worked on our Sorcerer’s of the Magic Kingdom quest. When we were finished for the day, we headed to Downtown Disney for a little while, to look around and see what was there. Afterwards it was back to the villa and into the pool. Friday was Animal Kingdom. I was in two minds as to whether or not to visit this park so we only scheduled one day. I enjoyed the park but it really did only need one day. We went on Kilimanjaro Safari, rode Expedition Everest and saw the Lion King show and also Nemo the musical. The girls also met with Pocahontas and Dug and Russel from UP. We finished the park around 4.30pm and made our way to Blizzard Beach which was a great way to cool off after a very warm day. For dinner we called in at a Denny’s on the way home and had a delicious meal there. Saturday was Epcot, another one day scheduled for a park. I didn’t expect to like Epcot but actually I really did. We quite happily spent a whole day there but there was a lot of walking involved. The morning was spent in Future World, where we rode Mission: Space, The Seas with Nemo & Friends and Spaceship Earth. We also dropped into the Character Spot so the girls could meet Mickey, Minnie and Goofy and then saw Chip and Dale just outside there. At lunchtime we walked into World Showcase, to Norway and Akershus Royal Banquet Hall where we were meeting Amy for a princess filled lunch. We had a meet and greet with Belle on entry, then also saw Cinderella, Snow White, Ariel and Aurora once inside. After lunch we made it around World Showcase and it’s countries, meeting with various characters. We saw Donald Duck, Jasmine and Aladdin, Mulan, Belle (in her blue dress) and Duffy Bear. This took majority of the afternoon but then we headed back to Future World to ride Soarin’. Finally we got something to eat and drink, before settling in on a bench and saving a spot for the evening’s IllumiNations display. It was truly beautiful and one of my favourite memories of the whole holiday. Sunday we were back in Magic Kingdom. We had breakfast at Be Our Guest booked, then I insisted on going to meet Gaston. Again, this was one of my favourite moments from the whole trip. After that we took on a mission to get as many meet and greets as we could, using the day to get the majority of the ones we were missing. We got the Fairy Godmother, Lady Tremaine (the sisters were on time out), Merida, Buzz Lightyear and Stitch. After all that we needed a rest so we did both Monster’s Inc. Laugh Floor and Stitch’s Great Escape. We also rode Space Mountain. We then took a wander, rode the Dumbo ride and did some shopping where the girls bought themselves hats with ears and got their names stitched on them. We then went into Peter’s Silly Sideshow and met Minnie and Daisy, followed by Donald and Goofy. When we got hungry, we ate at Pinocchio Village Haus, then did more of our Sorcerer’s of the Magic Kingdom quest. In the afternoon, the girls met with Tiana, Ariel and then Anna and Elsa, all before we went back to Be Our Guest for dinner. After dinner we met with the Beast and this was another highlight of my trip. Since the park was pretty quiet we got in a few more rides, this time the People Mover and Buzz Lightyear’s Space Ranger Spin. We then headed out and back to the villa. This was the end of Week 15, so onto Week 16! Monday (13th) was a day at Hollywood Studios. We had only scheduled one day and to be honest this was probably enough. That said, we had to make sure we scheduled carefully throughout the day to ensure we saw all the shows we wanted. We began the morning with meeting Baymax and Hiro. This was a must for the day so we needed to get in the queue early. After this we went off to ride The Hollywood Tower of Terror, then over to Star Tours for Chris and Amy to ride. We then went to see the Indiana Jones Stunt Show, followed by a wander and Muppets Vision 3D. After that the girls had their pictures taken with Lightning McQueen and Mater (though it was pretty pointless), saw the Cinderella carriage and then met with Mike and Sulley from Monsters Inc. After that we met with a Green Army man (from Toy Story) on our way to see Beauty and the Beast live (which was awesome). Next we rode Toy Story Midway Mania (which was so good) and then queued to see Buzz and Woody. Afterwards we went to meet up with Amy and some of her friends, to wait for Character Palooza. However it got rained off and so we ended up going our separate ways. Next we saw Voyage of the Little Mermaid and got some dinner. Finally we headed to Fantasmic where we waited quite some time to see the show but it was definitely worth it. Tuesday was our final day in Magic Kingdom (though we didn’t necessarily know it at the time). We rode Splash Mountain, Big Thunder Mountain and saw Mickey’s Philharmagic show. We also had lunch at Be Our Guest, met with talking Mickey Mouse, and Jessie & Woody. Finally we did some more on our Sorcerer’s of the Magic Kingdom quest, but on asking realised there was 9 quests and we’d only done 5 so we weren’t going to get it finished. When we left the park, we headed to Typhoon Lagoon to end the day and cool off. Unfortunately it closed at 5pm (not 6 like we’d thought) and so we weren’t able to do that as it was almost 5 anyway. Instead we headed to Downtown Disney briefly as Megan was searching for a dress she wanted and instead we found Tsum Tsum’s and she bought loads of those. We headed back to the villa for dinner. Wednesday was our last full day on holiday. We spent the morning back at Universal Studios and Islands of Adventure, letting the girls use their wands on all the “hotspots” around the park. This took us till just after lunch but we headed to Florida Mall and ate there – the girls having Taco Bell while Chris and I had Five Guys. We then wandered the Mall, going to Hot Topic and the Disney Store mainly. A friend I’ve known for 14 years, came to meet us at the Mall (we haven’t seen each other for 7 years) and it was lovely to catch up and wander around. At 6pm we headed to the villa to get my mum – the girls drove with Tim and so Chris and I just rode together for the first time all holiday. When we got to the villa, Tim suggested somewhere for dinner and we all headed out together. The place we ate was called The Cracker Barrel and it was lovely. The food was amazing and we were all stuffed. Afterwards we shopped a little in the store attached and then said a very sad farewell to Tim. We all headed home to the villa and the packing began. A few tears were shed and then we all headed to bed. On Thursday morning the decision had been made to spend the last few hours of holiday in Hollywood Studios and then Magic Kingdom. However the girls were up late and I didn’t wake them as I decided it was better they slept. The three of us headed out to Hollywood Studios as the Animation Academy was the one thing Megan had really wanted to do and didn’t get chance. When we got there it was about 10am but the first class wasn’t till 10.30pm, we waited and while we did so, we played on the “which disney character are you?” machines. Lily got Tinker Bell, Megan got Ariel and I got Lady Tremaine (I did say I wanted to eat nice people for lunch…). We then did the Animation class and got to draw Baymax. Megan also got given the artist’s drawing to take home with her. After this we decided it wasn’t really worth going to Magic Kingdom as it would take too long to catch the tram to the car, then drive to Magic Kingdom, then get the tram to the park etc. all before we needed to head back. Instead we waited to see Mr Incredible and Frozone, before riding The Great Movie Ride which was the one thing I’d wanted to do and hadn’t fitted in. Finally we said a sad farewell to the park and to Disney generally as we got onto the tram and rode back to the car. We then drove back to the villa where Mum and Chris were waiting, pretty much ready to leave. We packed everything into the car and then headed back to Florida Mall. There we got lunch – this time the girls got Subway, I got pizza and Chris and mum got Five Guys. We went to Hot Topic to spend our Hot Cash, then Lily and I ran to the Disney Store to spend the last of her dollars while everyone headed back to the car. We drove to the airport, dragged all our bags in and checked in. Without a blow by blow of everything then, we obviously boarded the plane and this took us to Washington. The plane was delayed but luckily the connection was too. We then boarded the second plane and this took us home. It was 11am on Friday morning when we arrived home and got off the plane. It obviously took us some time to get our bags, go through security etc. By the time we got to the car it was gone 12pm and mum drove us to a place in Northamptonshire where she was spending the weekend. Once mum was gone, we headed home, stopping at the first services we got to. There we had KFC for lunch and Starbucks to keep us all awake. We drove back to mum’s where I’d left my car and then swapped all our stuff over. We had to call in to see the kids’ dad at work but then we headed home, stopping only for bread and milk on the way. It was about 6pm when we got back and all of us just collapsed for a while. Despite the girls being tired I let them stay up a while so it felt like they had some time at home but then they headed to bed. Chris and I ordered takeaway and spent the evening watching TV. However we only made it till about 10pm before going to bed ourselves. Saturday and Sunday were really just days to relax. I didn’t get dressed at all on Saturday, just managing with the few bits we had in the house to eat. Nat came around in the evening and it was so nice to catch up. Sunday we had to take Chris to work so it meant getting dressed and on the way home we did the weekly shopping. However the rest of the day was spent lazy, trying to recover and get ready for the girls going back to school. So this ends my round up and also our holiday. I hope to get on top of blogging soon and update you all on the trip properly, as well as share my favourite moments, top tips and tons of photos! I’m back from Disney World!! So yesterday we flew back into the UK and then drove back home. It’s been an amazing two weeks but due to the travel and the jet lag I’m pretty exhausted! Over at Twice the Mum, Nat was kind enough to cover my Friday post but here on my own blog I know it’s been a little quiet this week! I’m behind on my 52 Project, my Monday Round-up and of course I just didn’t schedule many posts this week either. However I am back now and as of tomorrow I hope to be catching up. I’ll of course do the posts I’m missing, along with this week’s 52 Project and Round-up. After that I’ll be sharing all my holiday details with you so stay tuned!! Almost a year ago, I made a list of all the things I hoped to achieve during 2014. At the end of the year, I wanted to take a look back and see what I hoped for and what I’ve managed to actually succeed in. In a few days time, I’ll be putting together a new list of goals for 2015 and maybe looking back will help me decide what it is I want this coming year! This time last year, one of the things I vowed to do with my blog, was post at least once a week and if possible 2-3 times a week. I definitely achieved this for majority of the weeks, in fact for the last 3-4 months of the year, I was posting every day! As well as that, I said I would try to advertise myself more, mingle on Social Media and make blog friends. I’m confident to say that for the most part, I did do all these things. I know I definitely need to try harder on social media and hopefully in the upcoming months/years, make more friends too. Finally, my last goal with blogging, was to attend a Blog Meet. Not only did I attend one, but I also arranged one, so I’m pretty pleased with that! Also, though it wasn’t a goal, I started off the new year with 53 followers. Now at the end of the year, I have almost 700 more. Though the current total fluctuates a little, at the time of posting, my followers on Bloglovin’ were 735. I’m pretty proud of this! I’m sad to say, that really my money situation is no better than last year. I made the goals of getting myself out of debt – which I did to some extent – but I also know I could have been much better. I also aimed to save, by starting a saving scheme of £1 in week one, £2 in week two, £3 in week three etc. and about 7-8 weeks in, this all came crashing down. I would say I’m probably in a slightly more manageable financial situation than last year, but having just quit my job – I obviously have no idea how that will turn out. For the new year, one of the most important resolutions I made, was to shout less, keep calm and make the most of my time with the kids. I think for the most part I definitely achieved this and while working has definitely placed a strain on me, I’ve gradually got better at dealing with it. I’m looking forward to a few months without working so much and hoping it continues on calm and enjoyable like Christmas holidays have been. The other goal I set, was to plan and go on a family holiday – preferably Rome. A few weeks after making my goals, my mum announced she would be taking us to Florida in 2015 so really all savings needed to go into this. We did manage a few nights away in Berwick though, along with a visit to Edinburgh. We also had the odd day out, with visits to The Deep & Hull, Butlins in Skegness (though mum paid for this), Eureka, Adventure Farm, Harry Potter Studios, Warwick Castle, days at the cinema and other fun stuff too. I only set one goal this year and that was to host a gathering at least once a month, to touch base with all my friends – especially the ones at a bit more of a distance. I’m trying to work out in my head if I managed this and I think I pretty much did. In January I think we had a games night, in February a Valentine’s Murder Mystery, March had both Amy’s birthday Murder Mystery and Chris’ birthday games night, with April having an Easter Murder Mystery. May had both Erika’s birthday Murder Mystery and my birthday Murder Mystery, along with a Eurovision Song Contest night. June had my brother’s birthday Murder Mystery and July had Chris Boatman’s birthday Murder Mystery. A large group of us also attended Comic Con in July and while I didn’t host it, I definitely organised it. Sadly in September, we didn’t actually hold any official gathering. I’m pretty sure we had a games night or two, but it was just 4-5 of us, which I guess still counts. October had Halloween, November had Nat’s birthday Murder Mystery and December had both Megan’s Murder Mystery (involving mostly my friends) and the Christmas Murder Mystery. Next year will probably be far quieter but I’ll need to make some effort to organise something. Before I even refer back to my goals, I already know I’ll have done badly on this one. Sadly the year has just been so busy and working took up so much time, that nothing ever really got done on the house. One of my goals was to have the kitchen finished, the garden cleared and the hallway painted. In fairness, the hallway is pretty much done and the garden did get cleared, so its not as bad as I thought. Unfortunately nothing really got done on the kitchen so perhaps that’s a goal for this coming year – along with many others. Tidy and clean more was another goal and while I’ve probably done better than 2013, I know it still needs more. Just over the Christmas period I’ve got to grips with certain areas, so hopefully being off work will mean more time spent on the house! This was a bit of a mixed bag, when it came to success and failure. Get back on track with my diet and achieve my 10 stone target, was goal number one. With the help of Weight Loss Wednesday, over at Twice the Mum, I managed to drop 22 pounds. I still have another 23 pounds to go, to obtain my 10 stone target, but I’m confident over the next 3-4 months, that I should hit that goal. I wanted to find a healthy lifestyle and stick to it, along with go swimming more and venture onto the Wii Fit. I can hand on heart say that I didn’t really manage any of those things, except in summer when we went swimming more – largely to get Lily swimming and improve Megan’s swimming. Finally I wanted to quit smoking altogether and I’m glad to say I’ve managed this one. While I will admit I’ve had the odd one here and there, I’m not smoking on a regular basis and I’m definitely not purchasing them. I failed miserably on my creativity goals. I wanted to write more of my book – preferably finishing it – and take part in some sort of writing competition. I didn’t add a single word to my book (though I did help Megan plan one) and while I was > < this close to participating in NaNoWriMo, life just got far too busy and it wasn’t possible. That said, I did write a murder mystery for Megan’s Birthday and I did get creative in other ways – mainly clothes making and sewing. I’m hoping that some form of creativity is going to find me a new occupation in the upcoming year. My one goal for my career, was to find a way to work at home. While that didn’t really work out, I guess since I did actually quit my job on December 17th, I can technically say I completed this. I’m unsure what the new year will bring but I do know I’m not actually looking for a job. I have several things I want to do, but everything involves staying afloat, building up a business and/or planning for a better future job. Finally, in my list of goals, were some easy-going entertainment related goals. I vowed to read more books and watch more movies, even setting myself some targets. For reading, I set myself the goal of one book per month. Some months this would have been easy to accomplish, while others it felt impossible. Being out of the house between 8am and 4pm every day, definitely took its toll on my leisure time and I’m sad to say I only got 9 out of the 12 read (and even then only 6 of those were completed). I did enjoy some really good books this year, but sadly I also got stuck on some really rubbish ones too. Next year I hope to improve this figure and read a lot more. With regards to movies, I set the target of 52, working out as one per week. At one point I thought I was nowhere near, but counting up now I’ve actually watched 68 movies this year. 4 of those movies, I watched whilst being on my computer (so didn’t fully watch) but even deducting that, I still clocked in at 64, which is 12 over my target! All in all, I know that I tried. Looking back, I’m pretty pleased with everything I accomplished. I know its a bit of a cop-out, but working (and specifically the job I worked) was definitely my main stumbling block this year. I felt constantly tired, constantly like I didn’t have time for the things I wanted to do and fairly constantly miserable. I feel very positive, moving into the new year, knowing this hurdle is now gone. I know there will be other things that cause issues this year, but fingers crossed it will be a happier year overall! So half way through this evening, while I was writing my Monday Round-up post, our washing machine decided to die. I have to admit I’m not completely shocked by this – if I our washing machine was a person, it had recently been sounding like a 50-a-day smoker. However trying to resuscitate it and prolong it’s life, for 2 hours of our life, was sadly to no avail. Tonight our washing machine died. So in a very roundabout way, I wanted to explain why there was no round-up post this evening. There will be. But it will be tomorrow. Now if you’ll excuse me I need to find another way to wash my black clothes. So I can mourn for my washing machine properly! I’ve had a miserable week for the most part, not going to lie! My emotions have been up and down all week and I’ve been so very tearful. However by the end of the week I was feeling better and luckily its all just a memory now! The week started off as a fairly normal one. Work/School etc. I worked Monday night too which was surprisingly nice as I got my night shift out of the way early in the week while I had more energy and didn’t have to dread it come Thursday! I also like working in some ways as I tend to have a wander around town, do a little shopping etc. This week I bought some nail varnish which I’ve been looking for, for a few weeks! Highlights of the week included; Nat coming around both Monday and Friday night, catching up on OUAT for an awesome series finale episode on Wednesday, going to Lily’s school assembly on Friday. Of course, I’ve already mentioned it too but Chris and I were both off at the weekend and we worked SO hard on the house. Saturday morning we started off on the garden and while it took majority of the day, it was so worth it! After completely clearing the garden, we went to buy new fence panels and it looked so good! Even thought it was late, after we got panels and then popped to Tesco’s, we carried on! We started on the hallway, something that has bugged me ever since we moved in. The hallway was a sort of yellow colour, with a chinese style border. The girls and I have been picking the border off bit by bit for ages. Saturday night we covered up all the stairs, masking taped off all the edges and sponged off the rest of the border. We then left it all ready to start painting in the morning. We spent all day Sunday working on the hallway – it had about three coats in the end. We still have the gloss on skirting boards and door frames to do, but I’m really pleased with it! I’m not going to dwell on any of the bad points to the week, so that’s all the best bits. Today has already been far better than last week so I’m looking forward to a great week! So as you’ll know, yesterday I posted an update on my 2014 Goals, in my Quarter Quell. The post had originally started off as my weekly round-up but when I realised how long it was getting, I figured I better make them two separate posts. So here is my weekly round-up! This week has been great. Perhaps I’m only saying that now as its ending great (because it started manic) but overall its left me feeling like it was great! Monday I had only 3 days of work left, before breaking up for almost 3 weeks. This was a great motivation to get through the week. Not only that, but when I arrived home from work that day, I had both the Urban Decay palette that I’d bought, and also the Calvin Klein Endless Euphoria samples. To top off an already good day, Chris, the kids and I all sat down to watch Harry Potter and the Chamber of Secrets. The girls are enjoying the Harry Potter movies so far and I couldn’t be prouder! Next came Tuesday and it started off a little sad to be honest. Mum was having the kids that night (because I asked her to but still…) and so when I dropped them off at school I knew I wouldn’t see them again until Wednesday after school. Sometimes at work I have too much time to think and sadly this was one of those days. For most of the day I dwelled on not seeing them but the second work was out, I just got excited. The reason for that? I was meeting up with Nat and we were going to Meadowhall. Not only that, but we were going to see Divergent, 3 days before its official UK release! We were like two kids when we arrived at Meadowhall – honestly you would think we never get out! We spent a little while shopping (though I only spent £15), grabbed some dinner and then went to the cinema. Nat wrote a movie review and you can read it here. Nat called in for a cuppa when we got home and that was nice too. Another great day! The following day was Wednesday and in lots of ways, this felt like the end of the week for me. The working week at least. Wednesday was a good day at work and even more so because it was the last. Sadly I wasn’t able to head straight home though as Lily had a birthday party after school. Instead we headed to mum’s to get changed, wrap the present and generally waste time. We headed to Wacky Warehouse for 5pm and while Lily was in the party, Megan and I had some much needed M&M time (Mummy and Megan time). Thursday I had to get up at the same time, as if I was going to work! The kids still had two more days off work. However Lily had an Easter assembly at school and it was lovely to know I could go. Reception, Year 1 and Year 2 all put together the story montage of the Easter Story. Lily had one line and I was so proud that she was one of the few people who just remembered it and didn’t need her script. Afterwards I came home and was delighted to receive awesome mail! First up was a recorded delivery letter, which contained none other than my comic-con tickets. I seriously squealed and forgot all about the two other parcels sat on my lap for at least thirty minutes! One of the other parcels, was a new router for our home. We’re getting fibre optic broadband today (Monday) and the router needs to arrive in advance! The second parcel was my new subscription to the Discovery Club, courtesy of The Fragrance Shop. It’s such a good idea and relatively cheap. You pay just £5 a quarter, for 5 sample scents. This month there is actually 7 though. On top of that, you also get a £5 voucher off every scent in the box, meaning if you like one you can buy a larger bottle at a reduced price! No doubt I will be writing a blog post about its contents, once I’ve had a bit of a sniff! I spent most of the day just catching up on things, especially my blog. In the evening I continued to catch up, this time on OUAT and OUAT in Wonderland. I have to admit I was pretty devastated by the former, crying for a good 20 minutes or so. The latter fails to impress me still but I’m continuing to hope for better things! As I said before, the girls were still at school till Friday, so again I was up early. This time it was Megan’s turn for her Easter service, located in the local church. While I’m not particularly religious, it was quite nice to attend a tradition Easter service. It was even nicer to see Megan sing for both her Light Lunch club and also her X Factor club. Again, Megan is on the left. The very end of the line. When I headed home, I got even better mail! My new camera had arrived. It’s awesome and I love it and I really have to be careful not to waffle about it. So far I’ve only taken pictures using the auto setting but already I’m noticing the difference. Even my 52 Project photos were taken with it. The battery needed charging when it arrived so this stopped me playing with it for too long. Instead I headed for a bath, caught up on some HIMYM (though I’m still nowhere near the finale) and dyed my hair using the new Washed Up Mermaid dye I bought. I have to admit I’m fairly disappointed with it, especially for £5 a bottle. The first picture was after my first attempt (its only 15 minutes development time) and the second picture is after I tried again later that night. Its still not covered very well at all. In fact, because it was so pale, I even let the girls dye the ends of their hair. However sadly, Lily’s only took it a tiny bit and you can’t even see it on Megan’s. Anyway, in between my two lots of hair dying, I also had to go out and collect the girls from school. As a treat we headed to Pizza Hut, just the three of us, for dinner. Sadly Lily’s pizza came burnt, so she ended up sharing mine. This turned out to be a good thing as a) it meant I ate less pizza (being on a diet and all) and b) Lily’s meal got knocked off the bill altogether and the girls both got free ice cream. Our total bill came to £9.98 which was pretty good all things considered. In the evening, we dyed the girls hair as I mentioned, then we just hung out together. It was really lovely. Saturday was yet another great day. The girls and I spent some time picking our Grand National horses, though sadly none of us won. My first ever Birchbox also arrived, which was actually pretty exciting! As well as that, some t-shirts arrived in the mail from TeeFury. This is a site I have posted about a million times before. The shirts were of course Karen Hallion designs (I’m a little bit obsessed) and after posting the picture on Instagram, I was so excited to see that Karen Hallion herself commented on my pic! Chris came home just in time for the Grand National and so after that I made everyone dinner and then we settled down to watch the next installment of Harry Potter. This time we were onto Prison of Azkaban. The girls found it fairly confusing I think but they enjoyed it nonetheless. Finally onto Sunday and gosh it was a dreary day. We had planned to go to the park with some of Megan and Lily’s school friends and I thought at one point it was going to get cancelled. However we did go and it was nice. The kids love to get out to the park and sadly I don’t take them very often. I also gave my camera a bit more of a trial run. Afterwards we headed to my mum’s for lunch. Now it’s Easter Holidays I imagine we won’t head over that way very often so it was nice to call in while we had the chance. When we came home, the kids took some time to pack a bag for Daddy’s house and then we just relaxed for the rest of the day. I started a big cross-stitch project, which I will update about when I’ve got a little more done. Once the kids had gone off to their dad’s house, I settled down to some blogging and some TV. When Chris got home from work we caught up on more TV. We were tempted to stay up for Game of Thrones but honestly, I’m not that bothered. Besides we got up early this morning to watch it instead! Wow, what a week! Strangely it was actually quite a calm and relaxed week in lots of ways, but then suddenly at the end of the week it seemed to pick up momentum and just BAM! – Making Mug cakes. After seeing Amy’s post about Mug cakes, I decided I wanted to make one. Much like her I’d seen loads on Pintrest but just never gotten around to making them. On Tuesday Chris and I made one each, then on Wednesday I made a couple more with the kids. We had a lot of fun, especially when Uncle Chris’ mug overflowed with chocolate cake! – OUAT and OUAT in Wonderland! Last week, my brother and I finally managed to catch up with Once Upon A Time. So this week it was great to actually keep up, watching the next episode on time. We also managed to make a start on Once Upon A Time In Wonderland (which is just average so far) only to find out it will definitely be cancelled at the end of this season (oh well!). – Thursday we decided we were having our last takeaway (not ever, but at least for a while). This is for two reasons! One, I want to lose weight – you can see my weight loss journey if you follow Twice the Mum and Weight Loss Wednesday. Two, we need to save money as my brother is moving out this month and we won’t have his lodger money any more! **Spoiler Alert** It didn’t last long as we had takeaway again this following week. HOWEVER, that will hopefully be our last. – My Beauty Education began. On Thursday (after my kebab!) I posted about Spring Cleaning my life and as part of that, I want to adventure into new waters – beauty blogging. My first purchase was an Urban Decay pallette which I had been longing for almost a year. However I knew I would have to wait for it to arrive in the post! On Friday I picked up a couple of magazines after work, both of which had free beauty products with them, and started my first lesson. Friday night I started on Marie Claire. This had a free lip gloss by Neal’s Yard Remedies with it. Saturday morning I read Glamour. This had a free eyeliner from Model Co. I tried both beauty products, sniffed several perfume samples and learnt what I like about a magazine and what I don’t. There will be a post coming soon about these magazines! I also bought a sample perfume, signed up for Birchbox and joined the Discovery Club at The Fragrance Shop. After Marshall’s Yard, we headed to Tesco in order to buy the food for Mother’s Day dinner (since I was cooking for 9). 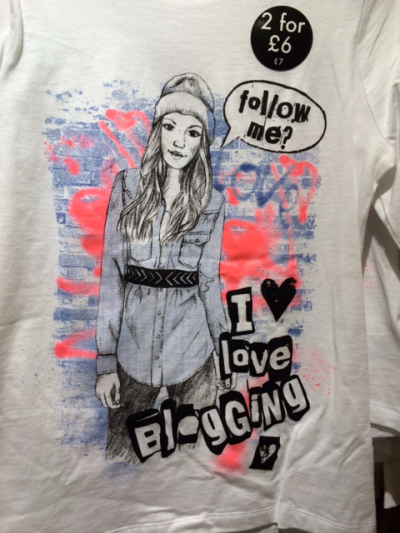 I also completely went back on what I’d said about “that” blogging t-shirt for kids – ending up buying it for both my kids. This is because Megan is actually now a blogger (and if you’re interested you can find her at Little Princess Blogs) and Lily is pretending to be, while I have her blog set to invite only/private. The day was really about making them happy and the t-shirts did so I’m happy to retract what I said before! Finally we headed into Gainsborough itself, doing a bit more browsing and shopping in places such as Superdrug and Boots. We ended up buying two Barry M nail polishes, both of which I’d wanted to try (Silk and Gelly), but the girls picked the colours. We came home and painted our nails – again, I’ll be reviewing the nail polish in a future post. The evening continued to be lovely as Nat arrived to re-dip-dye her hair. Since I had decided to try the new Bleach London colours (especially Washed Up Mermaid), I took the opportunity to re-bleach my ends – though I haven’t coloured them yet! This means I currently have blonde ends, though I’m actually quite liking them. – Mothering Sunday. Firstly I just have to say… who the hell decided to make Mother’s Day the Daylight Savings day too? As most mothers will know, sleep is something that can be very hard to come by at times! Not only that, but on Mother’s Day the kids seem to think its a great idea to wake you nice and early to give you presents and maybe even breakfast in bed. Take an extra hour off that for us and you’re already starting to take away from that whole “treat your mum on Mother’s Day” thing.. you know? Anyway…. The girls woke Chris at about 9am (new time) and they all headed downstairs to make me breakfast. This was nice as it gave me time to come around and actually be awake before I was presented with food. I was given pain au chocolat, croissant and french toast (some even with cheese!). I also got a cup of tea made in a huge mug. The girls brought up some food to eat with me too, though we soon had to evacuate the bed when Lily managed to croissant crumbs everywhere! The girls also got me a beautiful card and a stash of Lush. Though I’m grateful the girls’ dad still takes responsibility for Mother’s Day presents, I do wish he would listen to the girls though! They wanted to buy me bath bombs and bubble bars (my favourite) but he insisted on a shower gel (which I don’t particularly like the smell of) and a bar of soap (that smells great, but I don’t use soap… ever). Sadly I’ll be giving them away or even selling them – but the thought was there, nonetheless! After the lovely wake up, it was time to get up and get on with dinner. I cooked chicken wrapped in bacon, with mash and vegetables (also with cheese sauce or peppercorn sauce). We had ice cream, apple pie and chocolate fudge cake all for dessert and I think everyone enjoyed themselves. My present to my mum was mostly the dinner, but I also bought her some gloves which she’d asked me for and a book I’d seen recommended on Amy’s blog. The book is called Dear Mum and you can find it on Amazon. The basic concept is that you give your mum the book and she fills it in. There is everything from her life growing up, meeting your dad, having you and various other things. Once completed, she gives it back to you and you have a very unique keepsake. If I get time, I will be posting about this book separately as I really do think its lovely. Hopefully I will be on time updating my weekly post this week – fingers crossed! I also hope to post again soon with regard to a lot of the things I’ve mentioned in this post. Hope you had a great week last week and are having a great one this week too!